It gives me great pleasure to announce that the “I’m Alive with Clive” T-shirt has now officially made its debut. One of the “I’m Alive with Clive” T-shirt launchers, Holly Yee, is the first person in the world to wear and be photographed in an “I’m Alive with Clive” T-shirt. 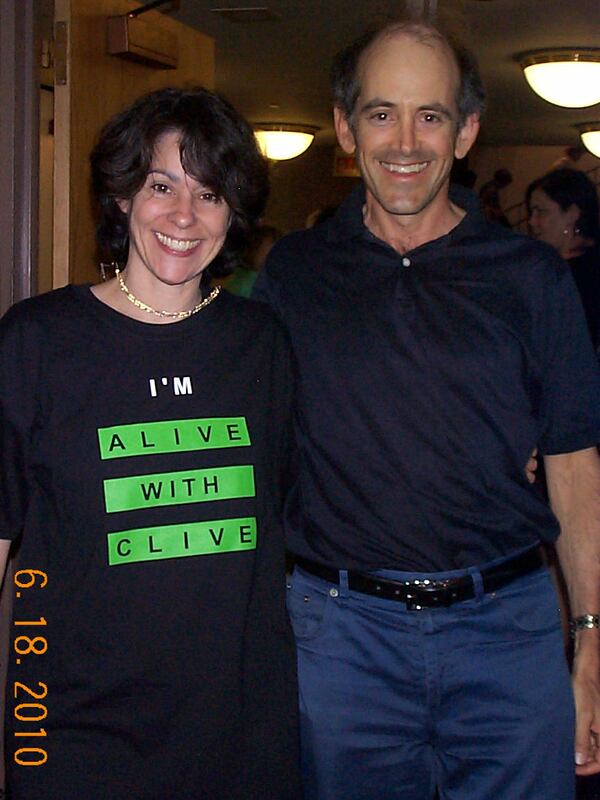 The momentous and historic event occurred this past Friday, and Holly has graciously authorized me to share with you the pictures in which she is featured wearing her “I’m Alive with Clive” T-shirt. Holly is a great friend and wonderful supporter of all my endeavors. She brought her children and friends to the first Alive with Clive Top 20 Concert that was held at Waltz-Astoria, in Astoria, New York, in May last year, and was kind enough to host a concert for Jeneen Terrana, who is in tenth place in The Alive with Clive Top 20, at her home to help Jeneen raise the funds to create her next CD, which she has already recorded. She was also one of the first people in the world to order an “I’m Alive with Clive” T-shirt. Here are the pictures of Holly wearing the “I’m Alive with Clive” T-shirt. As you’ll see, I’m standing next to her in the pictures in a black shirt. As you can see from the pictures of Holly and me, a black shirt looks so much more exciting when it is an “I’m Alive with Clive” T-shirt! I received the box containing the first batch of “I’m Alive with Clive” T-shirts last week, and am now in the process of delivering and mailing the T-shirts. I do still want to give the “I’m Alive with Clive” T-shirt launchers the opportunity to let me know their preferences for the five CDs that are being given to the people who ordered the first 25 “I’m Alive with Clive” T-shirts. So, if you’re one of the “I’m Alive with Clive” T-shirt launchers who ordered one of the first 25 T-shirts and haven’t yet let me know your preferences, please click here to see the five CDs that are being given away and complete the Bonus CD Preferences Form. In the weeks ahead, I may create other special offers involving CDs as bonuses. So, if you are not one of the first 25 people to order an “I’m Alive with Clive” T-shirt, and nevertheless take the time to complete the preferences form by clicking here, I’ll be able to gauge the CDs that are most popular and construct offers accordingly. I’m still making my book, Quotes To Multiply Your Magnificence – A Compilation of the Most Inspiring and Insightful Quotes of All Time! and all future updates, which I’m going to sell for $24.97, available FREE for a limited time to everyone who orders an “I’m Alive with Clive” T-shirt now. So, to order an “I’m Alive with Clive” T-shirt to help me to turn votes for musicians to be in The Alive with Clive Top 20 into dollars for people affected by HIV/AIDS in South Africa, click here now. I’m looking forward to seeing a picture of you in an “I’m Alive with Clive” T-shirt too! This entry was posted in Alive with Clive Top 20 and tagged A Braver Kind, Africa, AIDS, Alive with Clive, Allison Scola, Cassandra Kubinski, Clive Swersky, Heartstrings, HIV, HIV/AIDS, Hold The Sun, Holly Yee, I'm Alive with Clive, I'm Alive with Clive T-shirt, Irena Hart, Jeneen Terrana, Jessica Labus, Lisa Bianco, Mirrors, My Creation, PostData, Quotes To Multiply Your Magnificence, South Africa, Waltz Astoria. Bookmark the permalink. 2 Responses to The “I’m Alive with Clive” T-shirt Makes Its Debut! I know and love Holly Yee….if she is wearing your shirt you should be proud!She is 100% authentic and if she endorses anything it will be worthwhile!